1. Will you tell us how the biotic pump works? The biotic pump is a mechanism in which natural forests create and control ocean-to-land winds, bringing moisture to all terrestrial life. Winds tend to blow from areas of high air pressure to low. But how is a low pressure system created over land? Air pressure depends on the number of gas molecules. When water vapor condenses, it disappears from the gas phase; the number of gas molecules diminishes, and the air pressure falls. Therefore, if we manage to maintain the process of condensation over land, the latter becomes a persistent low pressure zone. Water vapor in Earth’s atmosphere possesses a remarkable physical property: it is unstable to condensation. This means if an air volume containing a lot of vapor is occasionally displaced upward, the air will cool so significantly that the vapor condenses. Due to this instability, if there is a sufficient amount of water vapor in the warm lower atmosphere condensation will occur. The green foliage and branches of trees have a much greater cumulative area than that of a tree projection on the ground. Hence, forest evaporation enriches the atmosphere with water vapor more efficiently than evaporation from an open water surface of the same area. Consequently, condensation occurs more readily over forests than over the ocean. Forests, rather than the ocean, become the low pressure zone where the moist winds converge to. Completing the cycle, moisture precipitates over the land and returns to the ocean in the form of river runoff. This figure shows the “tug-of-war” between the forest and the ocean for the right to become a predominant condensation zone. In Fig. a: on average the Amazon and Congo forests win this war: annual precipitation over forests is two to three times larger than the precipitation over the Atlantic Ocean at the same latitude. Note the logarithmic scale on the vertical axis: “1” means that the land/ocean precipitation ratio is equal to e = 2.718, “2” means it is equal to e2 ≈ 7.4; “0” means that this ratio is unity (equal precipitation on land and the ocean); “-1” means this ratio is 1/e ≈ 0.4; and so on. In Fig. b: the Eurasian biotic pump. In winter the forest sleeps, so the ocean wins, and all moisture remains over the ocean and precipitates there. In summer, when trees are active, moisture is taken from the ocean and distributed regularly over seven thousand kilometers. The forest wins! (compare the red and black lines) As a result, precipitation over the ocean in summer is lower than it is in winter, despite the temperature in summer is higher. Finally, in panel (c): an unforested Australia. One can often hear that Australia is so dry because it is situated in the descending branch of the Hadley cell. But this figure shows that such an interpretation does not hold. 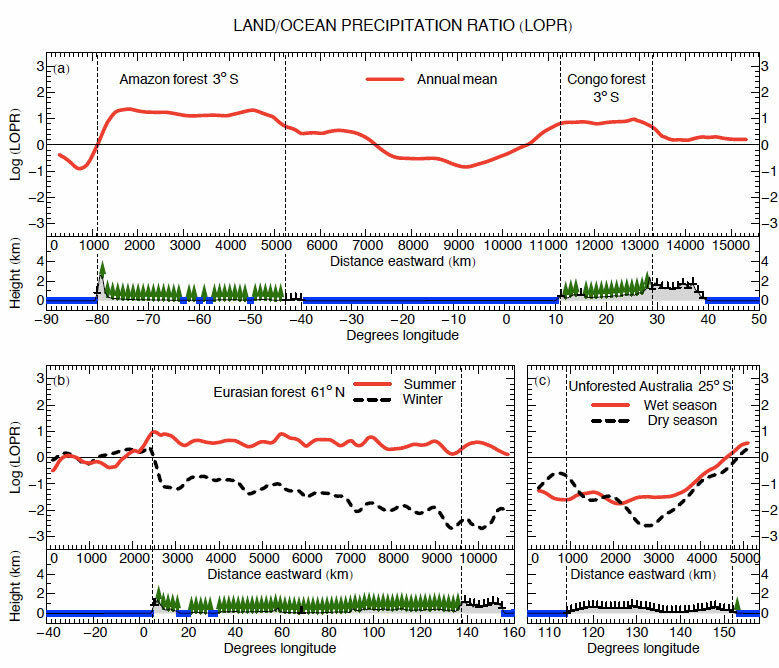 Both in wet and dry seasons precipitation over Australia is four to six times lower than over the ocean. There is no biotic pump there. Being unforested, oceanic moisture cannot penetrate to the Australian continent irrespective of how much moisture there is over the ocean; during the wet season it precipitates in the coastal zones causing floods. Gradually restoring natural forests in Australia from coast to interior will recover the hydrological cycle on the continent. Click to enlarge. 2. Why do you associate the biotic pump with natural forests rather than with individual tree species? Cannot a tree plantation act as biotic pump? As with all life processes, the biotic pump is a highly-organized complex process. In order to sustain condensation that keeps the air pressure low on land–so that moist winds blow to land from the ocean–there must be intense evaporation from the forest canopy. But evaporation diminishes the amount of moisture in soil. Moisture is additionally lost from soil by gravitational runoff. If all the soil moisture is gone, evaporation stops, and so does the atmospheric moisture transport. This means that a non-trivial balance must be maintained: forest evaporation must be exactly such that it never fully depletes the soil moisture but at the same time is intense enough to ensure that the amount of moisture brought from the ocean by winds compensates moisture losses in the soil. Native species that form natural forest communities have evolved a complex set of genetically encoded biophysical and morphological traits that make the biotic pump possible. These traits took hundred million of years to evolve. For example, the root system of forest trees facilitates both storage and extraction of moisture from soil; biogenic aerosols produced by trees control the intensity of water vapor condensation over the forest; the large height of trees determines the vertical temperature gradient under the canopy, keeping soil evaporation under biotic control; tall trees are also essential for surface friction that does not allow extremely high wind velocities to develop. Thus, natural forests not only create an ocean-to-land moist air flow, but also stabilize this flow at an optimum level and prevent its extreme fluctuations like hurricanes, tornadoes, severe droughts or floods. Species other than plants (bacteria, fungi, animals) are essential for the stability of the forest ecosystem itself. Monocultures or plantations consisting of a random set of plant species do not possess the required set of correlated traits. To give two extremely simplified examples: if one plants cacti, they will evaporate too little and will be unable to keep the atmosphere persistently moist. If one plants eucalyptus, they will evaporate readily but will be unable to prevent soil from drying. In either case, the biotic pump will not work. Generally, information fluxes processed by the natural biota exceed by twenty orders of magnitude the information processing capacity of modern civilization. It is not possible to create a technological analogue of the biotic pump. 3. Have there been any significant changes to your biotic pump theory over the last couple of years? The physical basis of the biotic pump consists in the statement that winds are driven mostly by condensation-induced pressure gradients rather than by temperature differences (such as warm air rises) as conventionally considered. As we judged from the first reactions to our work, this is the most difficult statement for the meteorological community to accept. Recently we concentrated our efforts on demonstrating the quantitative validity of the proposed mechanism of condensation-induced atmospheric dynamics. We have shown that it quantitatively explains hurricanes and tornadoes, having obtained from theory radial profiles of pressure and velocity that agree well with observations. On the other hand, we criticized some of the existing explanations of the same phenomena arguing that these contain physical errors. A full list of our publications concerning the biotic pump can be found here. 4. Have you seen wider acceptance in the scientific community for your theory? Generally, judging from the increasing number of citations of our first biotic pump papers, our work is gradually gaining more attention. The biotic pump theory calls on the meteorological community to admit a possibility that an important atmospheric circulation driver has been overlooked. As long as one continues to ignore the role of condensation in driving winds, one will continue to ignore the real role of forests in the water cycle and climate. Given the deforestation threat, there is no time to lose. So we are undertaking all possible efforts to stimulate a constructive discussion of condensation dynamics by members of the meteorological community. Makarieva A.M., Gorshkov V.G., Sheil D., Nobre A.D., Li B.-L. (2010) Where do winds come from? A new theory on how water vapor condensation influences atmospheric pressure and dynamics. Atmospheric Chemistry and Physics Discussions, 10, 24015-24052. For six months the editors could not find reviewers willing to publicly evaluate our work. After we informed the wider scientific community of our situation, a leading NOAA hydrologist circulated our work among many of his colleagues-meteorologists. Only one of them considered the possibility of becoming a referee, and he strongly objected to our work. As we have always welcomed any criticism to be put forward openly regarding our work, we suggested that the editor invite the referee even though we knew in advance that he had a negative view of our work. After the negative review was posted, we replied to all the arguments. Since then the paper was suspended, it has now been in open review for over fifteen months and it’s been twenty months since our submission. As any scientist will tell you, such extraordinary impediments and delays would discourage any researcher; they are disrupting the normal scientific process. But we remain hopeful that our efforts are not in vain. 5. Can you give an example of why the current understanding of condensation and precipitation is wrong? Our work was discussed rather widely on the web, sometimes with direct or indirect participation of leading meteorologists. These discussions revealed that the physics of condensation has not been given sufficient attention by the meteorological community, the result being that even some very basic issues remained unresolved and unclear to many. For example, a question that caused a lot of confusion was: if condensation occurs in the atmosphere and some vapor turns to liquid, will air pressure at the surface be affected near instantaneously or only after the raindrops have fallen to the ground? The latter is a common view caused by a fundamental misunderstanding of the concept of hydrostatic equilibrium. In hydrostatic equilibrium, air pressure at any height is equal to the weight of air in the atmospheric column above that height. Many meteorologists think that hydrostatic air pressure at the surface is equal to the weight of both air and all the liquid and solid bodies including the raindrops that are in the upper atmosphere. Had this been true, condensation in hydrostatic equilibrium could have never changed the surface pressure prior to precipitation fallout, because condensation of gas (vapor) into liquid does not change the total amount of matter. However, ideal gas pressure depends on the number of particles not their mass. The number of liquid drops is many orders of magnitude smaller than the number of gas molecules that have condensed into those drops. Therefore, condensation immediately lowers air pressure and disturbs the hydrostatic equilibrium. Recently a paper devoted to this question was published in a leading meteorological journal where, with use of numerical modeling, this conclusion was articulated. That a paper with such a basic conclusion has appeared only now–in the second decade of the Twenty First Century–demonstrates that the efforts to study the dynamic effects of condensation by the meteorological community are in their incipient stage. In the meantime, practically all climate and weather phenomena where condensation and precipitation are involved are challenging modern meteorology. For example, the existing global circulation models do not adequately describe the water cycle in the Amazon, with the modeled moisture convergence being half the actual amounts estimated from the observed runoff values. It is widely recognized that despite the ever-improving observation facilities and the available computer power, there is no progress in predicting the intensity of tropical cyclones. When analyzing how precipitation changes with time (e.g., in the Amazon or Congo regions) it is common to explore correlations with oceanic temperature anomalies. The conventional logic is that as the ocean becomes warmer, the warm air rises over the ocean and moisture precipitates there rather than over land, hence a drought occurs. However, such logic does not take into account that as the land becomes drier, it also warms significantly. It is unexplainable within the conventional paradigm why the warm air does not rise over the hot and dry land. All heat waves and droughts, like the one in European Russia in 2010 or the one in Texas in 2011, are associated with persistent descending air motion. Neither are flooding events explained by the conventional paradigm. For example, of the two extreme floods that hit Thailand in 2011, the first one occurred early in the year during the dry season. Then the land is cooler, the ocean is warmer and winds blow from land to the ocean, so that the continent remains dry. In early 2011 the region was struck by an unusual cold wave, which caused this temperature gradient to become even more pronounced. According to the conventional paradigm, this should only strengthen dry conditions. In reality, however, a major flooding happened. Evidence of this type, which is controversial with respect to the conventional paradigm, is mounting and the biotic pump concept gives a consistent physical explanation of how this should be interpreted. Rather than focusing on temperature gradients, which are often a consequence rather than cause of the circulation, one should investigate the conditions when condensation is likely to occur to predict changes in atmospheric circulation. 6. Recent evidence has linked the decline and fall of the Maya civilization to deforestation leading to less precipitation. How could the biotic pump theory connect to this? This data, as well as the data on the Nazca civilization in Peru, are in agreement with the biotic pump concept. It is noteworthy that the Yucatan peninsula is a relatively small region with maximum distance from coast never exceeding a thousand kilometers. This means that even so close to the ocean, massive deforestation can cause a significant precipitation decline. The proposed explanation (see article: Evidence mounts that Maya did themselves in through deforestation) based on a slight change in albedo after deforestation and a corresponding decrease in solar energy available for convection does not make sense to us (although as we understand this work has not yet been published so we could not read it in detail). The power of atmospheric circulation does not exceed around 1 percent of solar power. It is not limited by solar radiation, but by the flux of potential energy available for conversion to the kinetic energy. The conventional paradigm associates this potential energy with temperature-related buoyancy. That is, to put things simply, if you do not have a temperature difference, you do not have a circulation, all other things (including solar energy) being the same. We propose a different source of potential energy associated with water vapor removal from the gas phase: after the Mayan forests were destroyed, evaporation and condensation ceased to occur over the Yucatan peninsula (irrespective of how its albedo changed). The result was that the low pressure zone was no longer there and moist air ceased to come to the Maya from the ocean. Generally, the biotic pump theory calls us to re-analyze the historical evidence associated with land cover change and the changes in the precipitation regime. 7. How do you see deforestation in the Amazon as impacting regional precipitation? According to recent analyses, during 1973-2003 precipitation in the Amazon River basin was declining at a rate of 0.3 percent annually, which means a trend of about 10 percent for the entire period. This does not include the most recent devastating droughts of 2005 and 2010. In the meantime, deforestation in the basin has amounted to about 30 percent during the same period. Deforestation mostly disturbed southern and south-eastern parts of the basin, where the precipitation/evaporation is less than in the basin core. Assuming that the total biotic pump intensity is a function of the integral of local precipitation over the total forest-covered area, one can conclude that the decrease in precipitation intensity is of the same order of magnitude as the degree of biotic pump deterioration. As deforestation marches to the interior of the basin and affects the ever more productive forests with the most precipitation, the disruption of the water cycle in the basin will increase disproportionately. 8. How do you think widespread deforestation will effect the hydrological cycle of places like the Indonesian islands? Given their smaller size, do they need the biotic pump? The total area occupied by the Indonesian archipelago, including space between the islands, is quite significant. Open water space between the forest-covered islands can only slightly weaken the biotic pump of the Indonesian forests that likely determine the precipitation regime in the adjacent oceanic regions. Indeed, there is a relatively stable low pressure zone over Indonesia that causes the so-called Walker circulation: surface air moves from the high pressure region of the eastern Pacific ocean towards the low pressure zone over Indonesia. When this low pressure zone diminishes or erodes, the Walker circulation weakens and an El Niño results. When the Walker circulation is strong, we have a La Niña. These phenomena are well-known for their long-range impacts on the climate of the Americas. The biotic pump theory helps us understand why there is a low pressure system in Indonesia (because of intense condensation associated with forest functioning). Thus deforestation in the region should lead to a weakening of the Walker circulation. While this pattern needs to be further explored, it is worth mentioning that while the period from 1950 to 1975 was largely dominated by La Niña’s (strong Walker circulation), starting from the late 70s the frequency of La Niñas dropped. This is in agreement with the idea that Indonesian deforestation over the last 30 years could have modified the large-scale airflow. 9. Does the biotic pump theory apply to boreal forests, such as those in Russia, as well? Biotic pump of the boreal forest zone is fully responsible for atmospheric moisture transport from the (Atlantic) ocean over several thousand kilometers. Recent deforestation in European Russia is apparently disrupting this mechanism causing abnormal warming and droughts. 10. Does biotic pump theory modify our current understanding of global climate change? The widespread view is that global climate change is largely due to anthropogenic pollution of the global environment. The main anthropogenic pollutant is carbon dioxide, which is emitted by burning fossil fuels. CO2 is the second most important greenhouse substance in the atmosphere of Earth, therefore its accumulation in the atmosphere is believed to be the main cause of the observed warming and other climatic changes. The main proposed strategy to combat climate change is by reducing carbon emissions. However, the greenhouse effect on Earth is mostly determined by water vapor and clouds, i.e., by atmospheric moisture, which is the main greenhouse substance. The absorption interval of CO2 molecules covers less than 20 percent of the spectrum of thermal radiation of the Earth’s surface, while atmospheric moisture absorbs thermal radiation rather uniformly over the entire spectrum. Therefore, the impact of increasing CO2 concentrations on the greenhouse effect can be completely compensated by a relatively minor change in the hydrological cycle over land. Such climate stabilization can be performed by natural forests that control the hydrological cycle on land and the adjacent ocean, provided they are allowed to occupy a significant area. Conversely, destruction of forests leads to disruption of the hydrological cycle, which expectedly causes significant fluctuations of the magnitude of the global greenhouse effect, up to complete loss of climate stability and transition of Earth’s climate to a state incompatible with life. Most modern climate researchers have grown up on computer models of climate and are used to believing in the model output. As illustrated by the discussion of our work, it is rarely appreciated that by artificially setting the needed numerical parameters it is possible to simulate a very broad range of climate scenarios, including those that will agree with observations of the past. The existence of simulations that mimic the past and present reality does not mean that the physics included in the models is correct or that the model can generate a trustable prediction. What is more, modern climate modeling has been traditionally implemented by people with a technological background and little knowledge of ecosystem functioning. Such knowledge is generally poor, too. Thus, the ecological systems are “fed” into the models as a set of geophysical parameters, e.g., albedo, evaporation rate, surface roughness, amount of stored carbon etc. While the numeric values of these parameters are borrowed from reality, they do not represent the ecosystem functioning in very much the same manner as a colored high-resolution digital photo of a dead corpse does not represent a live human being. Without studying the principles of highly-organized functioning of ecological communities, including their genetically encoded ability to respond to environmental perturbations in a non-random compensatory way, the perspectives drawn from global circulation models with respect to the climatic effects of land cover change (e.g., statements like cutting all boreal forests will ease global warming) will continue to lack any resemblance to reality. Quantitative analysis of ecological and biological variables is a very complicated task due to the complexity of living objects. Consider a flying canon and a flying bird that are both under gravity. A quantitative description of the former is straightforward, while to predict where and how the bird will fly from initial conditions is not feasible. This complexity of living systems and the number of surprises it implies for global environmental research has only recently begun to be gradually appreciated across a number of disciplines, from organismal energetics to soil biochemistry and climatology. The biotic pump concept (and more generally the theory of the biotic regulation of the environment of which the former is a part) for the first time quantifies the stabilizing environmental function of natural ecosystems with respect to the hydrological cycle and pinpoints the physical mechanism that is responsible for this function. We must elevate the status of ecosystem conservation from a side issue in global environmental talks and treaties (that are exclusively focused on carbon) to an urgent high priority issue. We must also implement targeted research programs to study the stabilizing impact of natural ecosystems, to stimulate public discussion, and to raise people’s awareness of the real value of forests. 11. What policy changes does the biotic theory suggest for governments worldwide? 1. The biotic pump theory shows that natural forests are indispensable if we want to have rainfall, and, consequently, agriculture on the land where we live. This scientific message has important economic implications. First of all, people and governments worldwide should realize that economic growth cannot occur at the expense of cutting forests either in one’s own country or elsewhere. It is undermining the very pillars of our civilization’s existence. When water and food security are at stake, it is not possible for forest industries to focus on growth, just to increase the global production of wrapping and toilet paper. This should be the main topic of environmental campaigns. There are important branches of human activities where economic growth is not possible: that is, for example, fisheries. Consumption of natural fish products is limited by the rate of their recovery in nature, which is achieved by the mechanism of international quotas. Lack of such regulations could result in transient economic growth, but would ultimately lead to collapse of the entire industry when the fish base is depleted. For a different reason, economic growth is equally not possible based on criminal activities like selling drugs or human organs. Were such activities encouraged, as are other economic activities, this could lead to transient “economic growth” but then to the physical collapse of the population. Where this is understood, people are taking measures against such activities. The case with the forestry industry is less akin to fishery but more akin to drug and human organ selling. Humanity needs a large territory of natural, intact, undisturbed forests to run the hydrological cycle on land. This strict environmental criterion is incompatible with the criterion of “sustainability” applied in modern forestry, when trees are in the best case cut at the rate at which they regrow and when the majority of trees are cut when they are 50 years of age. Conceptually, this could be compared to growing human beings for organs and killing them when they are, say, fifteen years of age. Such an “economic activity” could be “sustainable” and “profitable” for some, but one cannot expect civilization based on such “economics” to be stable and give birth to Shakespeares, Mozarts, Einsteins etc. Human beings grown for organs cannot live a normal human life, they cannot work creatively or develop. Likewise, trees grown for timber cannot perform their environmental function and stabilize the climate: only a natural ecosystem with a full suite of all the necessary biological species can do this. In other words, society must urgently take the course of gradually shrinking the forestry industry. Destruction of natural forest ecosystems is a crime against humanity and will be increasingly perceived as such as new knowledge accumulates, environmental literacy increases, and ethical standards change accordingly. Such radical changes have happened in human history: slavery, once perceived as economically prudent and otherwise “normal,” was abolished. We must emphasize that the responsibility for the current situation, where natural forests are being destroyed, rests on all the people of Earth rather than with the forestry industry alone. We are all consumers of timber products. Because many livelihoods depend directly on forest exploitation today, large-scale programs are needed to gradually change the professional occupation of these people, to slow down the forestry industry and ultimately radically minimize their economic scope. In the meantime, government grants should support research aimed at finding new ways of wrapping things without paper or any other tree-derived product. 2. Governments should remember that natural forest recovery takes many decades and even hundreds of years, before the biotic pump acquires its full power. It is much easier to protect forests than to re-grow them. For example, tree planting in China has nothing to do with forest restoration; it is doomed to fail. To completely restore a degraded ecological communities is as difficult as cloning a mammoth in an elephant egg cell. Ecosystem medicine and health care have not yet developed as a science. In the meantime, we should urgently conserve all that we have now. 3. Efforts should be coordinated to protect both boreal and tropical forests. In countries with strong democracy society is more efficient at achieving nature conservation goals. It becomes possible for society to mitigate the negative environmental impact of even large-scale development projects aimed at resource extraction from yet widening areas. For example, in Canada the implementation of Plan Nord aimed at a massive intensification of resource extraction in Quebec was forced by people to include conservation of 50 percent of the affected territory, including a vast area with boreal forests, in an undisturbed state. This positive experience should be studied and shared among nations. 4. In an overpopulated world forests and the environment cannot be saved. Family planning is the main strategic tool to conserve forests and restore environmental sustainability. This entry was posted in biotic pump and tagged climate, deforestation, forests, precipitation. Bookmark the permalink. In the application of the biotic pump theory to large scale longer term changes such as the Walker Circulation mentioned in 8 and the loss of precipitation in the Amazon in 7, has any consideration been given to possible influence from the longer term oceanic oscillations such as the PDO and AMO? I agree that conservation of natural forests is extremely important, however I think we should consider the possibility that some of the changes in moisture regimes might be reversed by the reversal in sign of these oceanic indices. Better to correctly factor in these oscillations in advance of them falsifying a theory which doesn’t include them? I think it’s worth putting this up for discussion. It probably makes access to what Makarieva et al’s work is all about easier for some. It isn’t timber or paper products that are the largest drivers of deforestation, but livestock production. Livestock occupy 45% of the land area of the planet according to scientists at the International Livestock Research Institute ( http://mahider.ilri.org/bitstream/handle/10568/10601/IssueBrief3.pdf ) and the livestock industry is growing as more and more people work their way up the economic ladder. Preserving forests is about respecting all life, which begins with those at the top of the economic ladder switching to plant-based diets, while drastically reducing their intake of Dioxins, Phthalates and other fat-soluble chemical carcinogens that blanket the planet today. Make that the healthy diet of choice and forests will have a chance to recover and live, along with the rest of us. This is not true. Firstly, WV isn’t a gas, it’s a liquid. As it rises and cools it condenses, but condensation is not the source of it’s instability.